Goodness, all the kinds of sauerkraut! If you are in Europe, often you are able to get sauerkraut fresh from the barrel. You can get organically grown sauerkraut, sauerkraut made with wine and many other wonderful options. If this is the case, I would not wash off the sauerkraut, as it is fresher and not so salty as the canned kinds that are found in the States. In America, you can find milder varieties that do not have so much salt, I would also not wash them, as the sauerkraut juice is very health and good for the intestines. However, if you can’t find that, then I would probably wash the regular canned sauerkraut off a bit as it has quite a bit of salt. Drain the sauerkraut and rinse (if needed) to remove some of the saltiness. Separate a bit with a fork. Cook 500 grams of potatoes and grate. Alternatively you can use frozen potato hash or roesti. Peal and cut the apple in small pieces and mix into the sauerkraut. 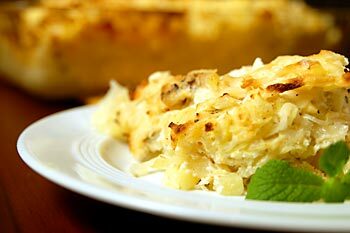 Mix the sauerkraut and grated potatoes together. Cut the sundried tomatoes in small pieces, and add to the sauerkraut mixture. Grease an oven proof casserole dish. Place the sauerkraut / potato mixture in the baking dish. This recipe makes a nice light, fluffy casserole. If you prefer one that sticks together more, I would advise making a bit of a cream sauce and then adding some of the grated soy cheese to it. You can make the cream sauce with 1/2 cup or 100 ml. of soy milk or soy cream and a teaspoon of corn starch. Mix these together cold, and then put in a sauce pan..and cook, stirring constantly until it thickens, it will only be a few minutes. Remove from the heat, add the grated soy cheese and then mix well. Sprinkle the rest of the soy cheese on top. Place in a medium oven for 20 minutes or until the cheese is golden brown. I serve this meal with a fruit salad, and dark brown bread as pumpernickel. Traditionally a dark German beer is drunken along with it. A cider or cider is also nice with it or a white wine. Posted by Chris Walker on November 30, 2006 in Main Dishes, Potato, Sauerkraut, Soy cheese.